Sun World Travel is Tallahassee's oldest and largest travel agency. We are local and have had the same owners since 1981. With more than thirty years experience we offer exceptional service and expertise. We can give you the personal touches that booking online can’t and our volume of sales equals vacation savings for you! There are no booking fees for cruises, tours, hotels, or vacation packages. We also specialize in group cruises and tours. Call or e-mail today for a no obligation quote on your next adventure. Click on Photo for Exciting Offers! Traveling with Oceania Cruises is truly one of the world's most outstanding values. Our 2 for 1 Cruise Fares even include FREE AIRFARE,* regardless of current airfare prices. Indeed, you'll find many important and valuable extras are offered at no additional charge. Value of this sort, while rare, is the distinguishing characteristic of Oceania Cruises. Northern Europe sparkles in the summer months, and the history and splendor of its most fascinating ports are yours to discover. The canals of Bruges and Amsterdam offer a peaceful way to experience these picturesque cities, and Hamburg calls itself Germany's "Gateway to the World." In Oslo modern meets old-world in a delightful mix of architectural styles, while in Denmark the cafés and restaurants are buzzing in the warmth of the summer sun. From the remarkably preserved medieval old town of Tallinn to the dazzling palaces of Russia's once powerful tsars in St. Petersburg, this is your world to explore. Holland America Line, which historically has chosen ship names with Dutch heritage, will christen its next vessel Koningsdam. Yes, it’s a little unusual, especially compared to its competitors who manage to wedge their brand names into the ship’s name. But it fits in with Holland America’s tradition to end its ship names with the “-dam” suffix — which it has done since 1883! The word “koning” means “king” in Dutch. 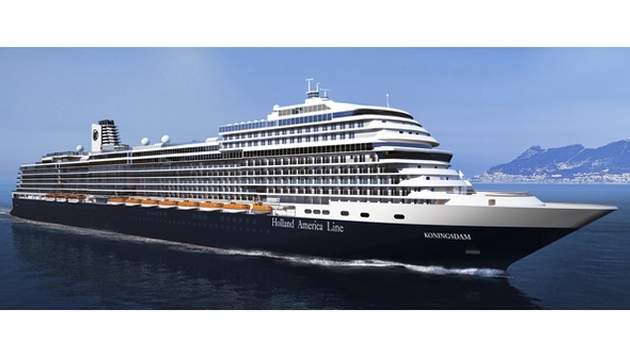 Holland America said the name honors King Willem-Alexander, the first king of the Netherlands in over a century, as well as the company’s long relationship with Dutch royalty. Where the name differs from Holland America tradition is that it is original. Many of the line’s ship names are reused time and again. The 99,500-ton, 2,650-guest cruise ship is scheduled for delivery in February 2016. The company said the ship will introduce some new features while familiar favorites will return. It is being designed by Adam D. Tihany, a renowned hospitality designer, along with distinguished maritime designer and architect Bjorn Storbraaten. For more information please call our travel experts at (850) 681-9074. Copyright Sun World Travel, Inc. 2014©. All rights reserved. Click HERE to see our Travel Club Specials! Click on the tabs to see our offers, benefits, get answers to some FQA, and more! It's quick, easy and FREE to join and start saving today! Get the Latest Information from the TSA for your next flight! We Can Expedite Passport Applications for Emergency Travel Situations! Smart Traveler Enrollment Program S.T.E.P. and nationals traveling abroad to enroll their trip with the nearest U.S. Embassy or Consulate. destination country, helping you make informed decisions about your travel plans.